The debut Foodilic on North Street is rather an interesting affair, taking the all-you-can-eat concept and applying it to, essentially, salad rather than Asian food. And it’s very good. A real bargain, there’s a much greater range of food than you might think, including hot grub as well as more types of salad and vegetable dishes than you’d imagine existed. There’s also good quality meat on offer too. To say we’re fans is something of an understatement, and we’ve been meaning to review the place for some time. The launch of a new restaurant on Western Road gives us a good excuse to try out the same great idea in a different place. Or not, actually. We’re rather surprised to enter and find no buffet tables loaded with colourful vegetables. Instead there’s a canteen-style counter with a wide variety of cooked dishes. Our disappointment is short lived as we survey the wide range of ready cooked and cold dishes from coq au vin to confit of duck leg, alongside many interesting salad dishes. The set up is closer to Iydea than the original Foodilic, but with the added advantage of meat, though you can’t pick and mix. We choose the stew (£6.50 to eat-in; all dishes are cheaper to take away) which is rich and full of big chunks of beef, served with rice and a cold green bean and mange tout salad. We wash it down with a pure apple juice (£3.50) as thick as any smoothie we’ve had. It tastes of goodness. 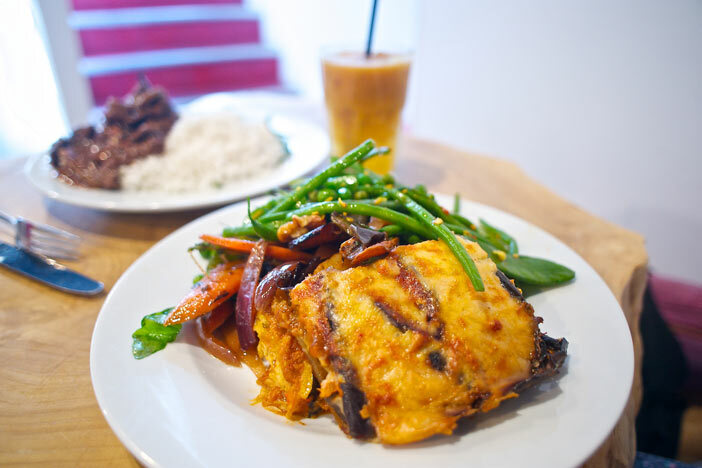 The moussaka (£4.50) is also lovely, with lots of cheese and big chunks of veg. The two salads we add (£1.80 each) are very fresh with lots of herbs and oils to jazz them up. Is this new Foodilic as good as the first one? Yes, it’s every bit as good. We prefer the concept of the North Street eatery, perhaps because we’re greedy, but there’s no complaints about the quality of the food on offer, or the range. Healthy food doesn’t have to be boring, or expensive. We’d been handed our food before we got the camera out, so who cares?